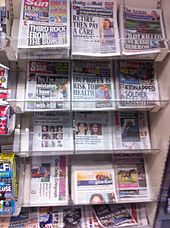 An interesting recent report by the Migration Observatory at the University of Oxford examines how the subject of immigration has been covered in British newspapers over the past decade. You can read it online here and in PDF format here. Overall, the report finds that press depictions of migrants have focused on concern about high levels of net migration, and particularly EU migration. According to the report, the number of press articles mentioning immigration showed a trend of decline from 2006 to 2011, but rose significantly from 2012 onwards, coinciding with the coalition government's measures to reduce net migration. "Notably, the average month in 2014—the last year in the dataset with a full year for comparison—contained over twice as many articles mentioning immigration than in 2011," the report notes. The Migration Observatory found that the most common word to describe immigration in the British press over the past decade was 'mass'. The four most common modifiers after 'mass' were 'net', 'illegal', 'European' and 'uncontrolled'. When it comes to describing immigrants as people, the term most used by the press was 'illegal', with the term accounting for a full 30 per cent of all modifiers used for 'immigrants' or 'migrants' since 2006. However, the report adds that the prevalence of 'illegal' as a way of describing immigrants has declined, as the emphasis shifts instead to scale and numbers. The report found that the second most frequent way that the press described immigrants was with the terms 'EU' or 'European'. Coverage of EU migration has tended to focus on the scale of migration. With refugees, the Migration Observatory found the press tended to describe them in terms of their geographic origins more than immigrants: "since 2012, the press mentioned Syrian refugees the most. Prior to that point, 'Palestinian' was the most frequent modifier of 'refugees'." • A tendency for journalists themselves to play the role of framing problems in the migration debate, rather than simply reporting on others' (such as politicians,' think-tanks,' or academics') analysis. This highlights the key role played by journalists and media organisations in shaping the UK migration debate. • A tendency to blame politicians for the scale of EU migration, while in discourse about 'illegal' immigrants, migrants themselves are often blamed. Economic arguments dominated the discussion of problems related to both EU and illegality. • A sharp increase in the volume of newspaper coverage relating to migration since the election of the Conservative-led coalition government in 2010, particularly after the introduction of measures to reduce net migration in 2011 and 2012. • An apparent change in how immigration is discussed, with a significant decline in discussion of the legal status of migrants and an increase in the focus on the scale of migration from 2009 onwards. This was accompanied by a rise in the relative importance of discussion relating to 'limiting' or 'controlling' migration since 2010. • A sharp increase in the frequency of discussion of migrants from the EU/Europe after 2013, with a particular spike in 2014 when migrants from Romania and Bulgaria achieved full access to the UK labour market. • A notable change in depictions of refugees between 2006 and 2015, with a sharp increase in references to Syrians coinciding with the escalating Syrian refugee crisis. In concluding, the report notes: "Media coverage of migration issues divides opinion. To some, British newspapers are barely-regulated juggernauts of opinion, pushing political agendas and shaping the UK's policy landscape. Others see the UK press as champions of common sense, reflecting the voices of the people and dealing with complex subjects in a forthright manner. Regardless of one's position on these issues, it is clear that there is an important relationship between the nature of media coverage, policymaking and the public debate."